Roman Minin originates from Donbas, a part of Ukraine which after 2014 became an epicenter of armed conflict and a hot spot of separatism. In his aesthetics, the artist appeals both to the modernism of early 20th century and to Soviet monumental art and graphics. In his new work, Roman Minin continues his traditional research of Donbas miner image in the context of widespread mass culture stereotypes. The artist dug into the story of a legendary Ukrainian football club Shakhtar (Miner); its name has stayed unchanged since Soviet times. Previously, the image of mining had such high profile it bordered on a cult. This example made Roman think about the devaluation of this profession’s prestige in post-Soviet Ukraine. Besides, in the real context of contemporary Ukraine, there have been no real miners playing football in Shakhtar club for a long while. 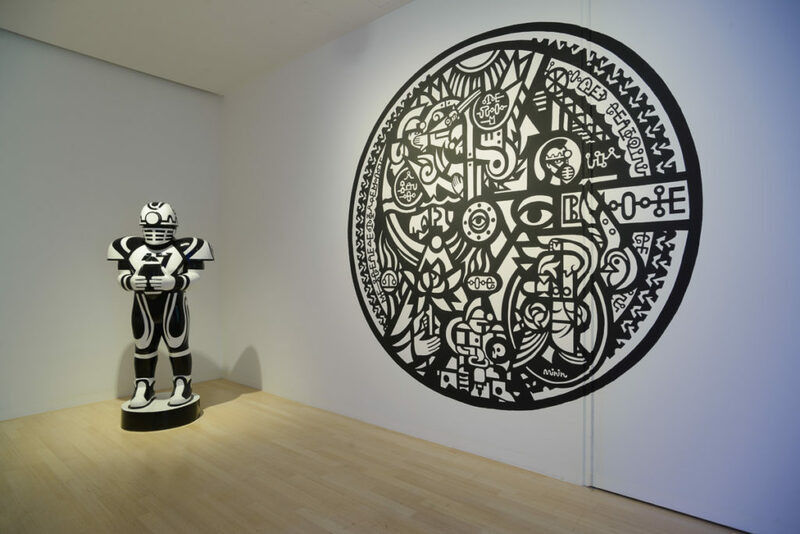 To emphasize the absurdity of the situation, the artist makes his character, which is depicted in an ornamental style traditional for Minin’s works, play exotic American football.